PARKING IS FREE at Southport Sharks for members and guests visiting the club. 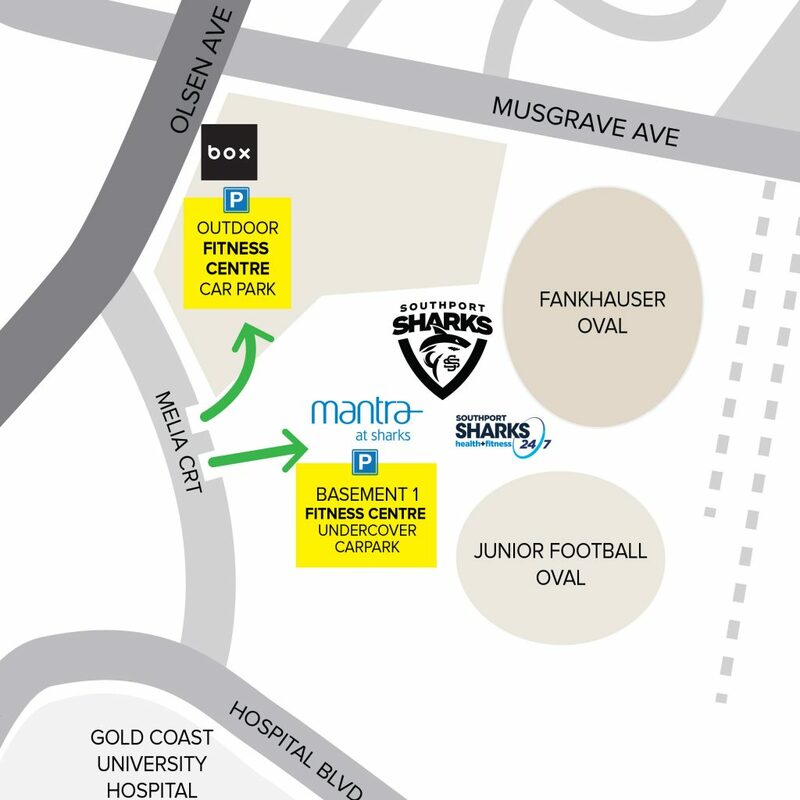 There are 500 car parking spaces, plus an extra 209 spaces allocated to Mantra at Sharks and Southport Sharks Health + Fitness members. Southport Sharks Car Park is only for the use of our members and guests whilst using the clubs facilities, this is applicable at all times. The two basement levels of the hotel car park are allocated to SSH+F members only – a 3 hour limit applies. Designated SSH+F basement car parking spaces should be utilised by members. However, if the allocated car spaces are at capacity, SSH+F members can use the dedicated outdoor car park allocated to SSH+F (this is facing Melia Court, alongside Box Coffee Co – see map below). SSH+F Members, simply show your key tag upon entering the car park. Parking is available around the oval for people visiting the Health and Knowledge Precinct for $6 per day, via the boom gate entrance to Fankhauser Reserve. Payment can be made upon exiting via a Visa or Master card (debit or credit card). No other EFTPOS cards accepted. Weekly Passes are available for $40, with car parking located at Car Park 4 (Melia Court car park). These passes are valid for five days from Monday through to Sunday and directions can be given by the car parking attendants upon your arrival. Cash or Visa or Master card (debit or credit card) payment is required on arrival for the Weekly Passes. No other EFTPOS cards accepted.